Land Tours by Adrift Adventures. We reserve the right to cancel trips due to weather or insufficient number of people. Full refunds will be made for those reasons. Cancellations of Arches coach tours made within 24 hours of trip are non-refundable. Cancellations of 9 and 14 day van tours are non-refundable within 45 days of original departure date. Discounts and special rates for groups. Rates do not include 8.6% sales tax. Guide gratuities not included in price of trip. Call or write for our free summer planner. RAFT AND JEEP - 7:30 a.m.
Meet at our office at 7:20 a.m.; return about 4:00 p.m.
2 Hr. Hummer trip with afternoon river trip through the Fisher Towers Section of the Colorado River. Meet at our office at 8:00 a.m. and return approximately 4:00 p.m. 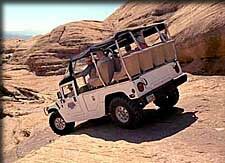 Some of the most wonderful and varied scenery in the world has attracted the movie industry to the Moab area. This tour affords you the opportunity to experience the scenic beauty and geographic diversity while visiting many of the sites where over 50 movies have been filmed since 1949. You will learn about the making of some of these films, while discovering first hand why movie companies have found this land so enchanting. Also, taste Moab wines at Castle Creek Winery and visit the John Wayne Museum as part of your tour. Depart: 8:00 a.m. Return: 12:00 p.m. Depart: 1:00 p.m. Return: 5:00 p.m.
Click here for National Park 4x4 tours. 8.6% sales tax Not Included In Trip Prices where applicable. $3 BLM Land use fee not included.